MIAMI – Tiny Hurricane Danny continued to push westward across the Atlantic on a path for the Caribbean on Friday and strengthened into a Category 2 storm. But forecasters don’t think that trend will last for long. The winds of the first hurricane in the Atlantic this season increased to 105 mph as of the 10 a.m. CDT advisory from the National Hurricane Center. 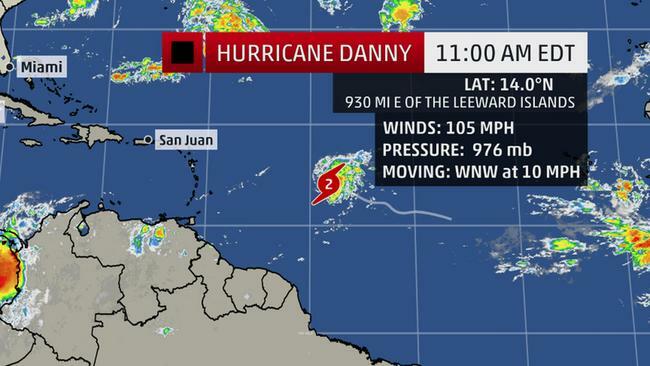 Danny was located about 930 miles east of the Leeward Islands and was moving west-northwest at 10 mph. Danny was expected to stay on that path for the next day or so, the hurricane center said, and turn more to the west by Saturday evening. 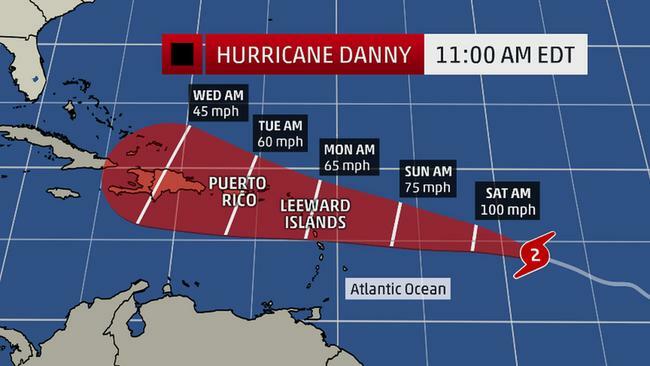 If that track holds it will take Danny right through the Lesser Antilles and into the Caribbean. It could also come very near Puerto Rico and Hispaniola, according to the hurricane center’s official forecast path. Danny is expected to weaken by that time, forecasters said. The hurricane center said Danny’s eye became more distinct overnight and the cloud tops cooled in the eyewall, indicating stronger storms and overall strengthening. Danny is in an area with low wind shear (which can tear storms apart or keep them from strengthening) and warm water — and the storm is forecast to stay in those favorable conditions for the next day. But after that the wind shear is expected to increase and Danny will encounter more dry air. Both of those things should weaken the storm as it nears the islands. Danny is an especially small storm. The hurricane center said its strongest winds extended only about 15 miles from its center. A NOAA aircraft is scheduled to investigate Danny on Friday afternoon, and an Air Force Reserve reconnaissance team will conduct missions on Saturday, giving forecasters a better idea of Danny’s strength and structure, the hurricane center said.